You’re playing Modern and you want to make sure you beat Izzet Phoenix. You also want to make sure you beat all the decks trying to beat Izzet Phoenix (like Grixis Whir, Azorius Control, and Golgari Midrange). You also like watching your opponents writhe when you cast Karn Liberated. I’ve already written an article to convince you why playing Tron is great, which means you already know how to mulligan aggressively and that pairs are bad, so today we’re jumping right to the tough part: the sideboard guide! I came in 14th place at SCG Philly last weekend with my Tron deck, picking up a draw that would have been a win with one more turn and a loss to eventual champion Austin Collins in round 14 where I could have played tighter in Game 3. My fiancée Nicole also narrowly missed day two with the deck, and then rattled off a 7-0 start in the Modern classic only to be felled by consecutive pair down losses into 9th place. Put simply, Tron is in a great spot right now. So let’s get right to the guide. Tron’s Izzet Phoenix Matchup is very good. You put a lot of pressure on them to have their best hands (attacking with Awoken Horror or multiple Arclight Phoenix on turn three) because they don’t really interact with you in any meaningful way besides just killing you. As such you are mostly free to drop Wurmcoil Engine after Wurmcoil Engine and mop up with Ugin, the Spirit Dragon and Ulamog, the Ceaseless Hunger. Thragtusk is huge as always, both on the ‘staying alive’ front and to slim our deck down a bit in anticipation of Blood Moon. If you see Pyromancer's Ascension in addition to Blood Moon you can consider a few Nature's Claim but you are more than capable of winning through Blood Moon by itself. On the other end of the Arclight Phoenix coin is Mono-Red Phoenix, which is a very difficult matchup. Whereas Izzet Phoenix’s best draws attack you with an Awoken Horror on turn three, Mono-Red Phoenix’s best draws just kill you on turn three. You are far more concerned with their prowess one-drops than their Phoenixes so Relic of Progenitus is gone and you get to add the set of Thragtusk to your set of Wurmcoil Engines and just hope you can cast them early and often. They sometimes have Blood Moon, but you’d almost be interested in Nature's Claim regardless just to gain some life. Dredge is usually a good matchup as long as they don’t go wild with Creeping Chill and Conflagrate. They have a tough time beating a Wurmcoil Engine, and of course Ugin, the Spirit Dragon is lights out. Your goal is to lean up a bit and make sure you don’t get burned out. Dredge will usually win when they can fire off a lethal Life From the Loam-fueled Conflagrate at your face the turn after you cast Ugin or Wurmcoil Engine. Don’t let that happen and you should be fine. The big three “big mana” matchups are all very similar so we will hit them all in a row. Amulet Titan goes bigger than you and is a bit faster than you, so all that really matters is how fast you can Stone Rain them. Karn Liberated, World Breaker, and Ulamog, the Ceaseless Hunger are the only cards that really matter, and you must aggressively mulligan to hands that can cast them early. Nature's Claim and Thought-Knot Seer can slow them down, but it’s all about as many Stone Rains as possible. Without Amulet of Vigor to Nature's Claim or the occasional creature to kill, the Scapeshift matchup is even more about Stone Rain. You can buy a little time with Thragtusk or maybe snipe a spell with Thought-Knot Seer, but again you just need to Karn their lands early and often to have a chance. Don’t be afraid to mulligan even more aggressively than normal because you will not beat them with a medium hand. The Tron mirror is not very fun. 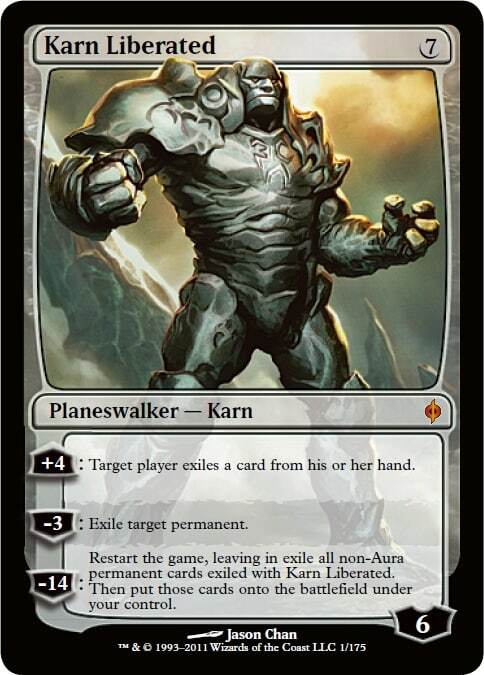 It’s almost impossible to break serve on a turn three Karn Liberated on the play, and that should be your goal. Nothing really matters but Stone Rain, so mulligan aggressively. If your hand is mediocre and you have a chance to snipe an early Chromatic Sphere or Expedition Map with a Nature's Claim in the hope to cheese them out, do it. Another good matchup where you force them to have their top percent of hands to beat you. Your most important thing in this matchup is assembling Tron, once you have it they can’t take it away from you and you can usually find something good to do with it. Buy time with Thragtusk and prioritize your creature spells to play around Stubborn Denial. Shadow is another deck that struggles with Wurmcoil Engine, so just keep doing your thing and don’t die to Temur Battle Rage. Burn can be tough. If you’re lucky and can land a turn three Wurmcoil Engine in Game 1 you’ve got a shot, but typically they kill you before you’ve set up. We bring in most of our sideboard here with the intent of gaining life and staying alive. You must also turn the corner and kill them as fast as possible or you risk them drawing out on you. Four life for one Green mana is pretty great so don’t feel bad about Nature's Claiming your own stuff, and remember that if you Nature's Claim a Chromatic Star you still draw a card. Play around Skullcrack if you can. Your goal against control decks is to just present threat after threat until they relent. They may be able to break up your Tron with Field of Ruin, possibility even for good with Surgical Extraction. That’s fine, Thragtusk only costs five mana anyway. Don’t let them play a planeswalker on an empty board if you can unless you have a good way to punish them. Most extraneous artifacts come out to hedge against Stony Silence, and don’t forget that Nature's Claiming your Wurmcoil Engine in response to a Path to Exile is nice. Humans is usually a pretty good matchup, as they need a very fast had to get out ahead of Oblivion Stone or Ugin, the Spirit Dragon. Big daddy Thragtusk to the rescue once again to buy you time, while your removal spells are a big boon against Meddling Mage and Kitesail Freebooter. Be wary about keeping cantrip heavy hands that are soft to Thalia, Guardian of Thraben, especially on the draw. Tron has always been naturally good against prison decks because of how heavily they rely on Ensnaring Bridge. Ulamog, the Ceaseless Hunger and Karn Liberated don’t care nothing about no Ensnaring Bridge. Nature's Claim gives you even more tools alongside your planeswalkers and Oblivion Stones, so just play carefully and you should be fine. Be aware they board in planewalkers against you to try and speed up the clock. That covers most of the major matchups in the format and should provide you enough information to figure out the rest. 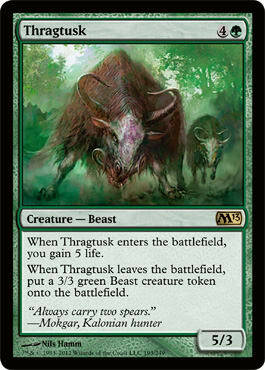 Realistically it’s all about Thragtusk. If they aren’t trying to turn three or four combo kill you Thragtusk is your card. It buys you time against the fast decks, and makes opponents who waste critical turns playing hate cards like Blood Moon or Damping Sphere feel very dumb. Otherwise just figure out what the game is going to look like and try to sideboard and mulligan accordingly. You’re never going to win against Valakut on the draw if your first big play is a Wurmcoil Engine on turn four, but that may be good enough against Death's Shadow.